Slowly but surely the prices of 450SLs are on the rise. It's tough to find a nice one now for much less than 10K. 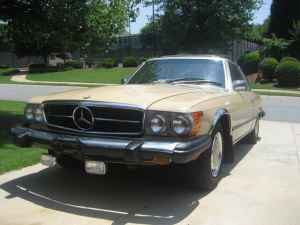 For half that price you can have a very nice example of the 450SL's big brother, the 450SLC. The 450SLC was essentially a longer wheelbase version of the SL. It had a usable (although not very comfortable) backseat and was available only as a coupe. The styling of the SLC was controversial. Many people felt adding 14" to the 450SL ruined the cars lines. To my eyes it's not all that bad looking. I'm not crazy about the louvers behind the rear windows and I could do without the chrome wheel well moulding, but all-in-all it's a nice looking car. The interior is standard 1970s Mercedes Benz. Austere by today's standards, it's functional, has a well laid out dash and is durable. The 4.5 liter engine is an incredibly strong engine. It's almost the norm for them to go 200,000 miles without having any major work done and I've seen a few 450SLs advertised with over 300,000 miles on them. Even more so than the 450SL, this is not a sports car. It's not very nimble and it's heavy, but it's still enjoyable to drive. There's not a lot that goes wrong with Mercedes', but parts, when they need to be replaced, are not cheap. SLCs are not prone to rust. But, when looking at a car that's lived much of its life in an area where salt is used on winter roads you should check the front fenders, around the headlights, the wheel wells, inside the trunk and the rear section of the chassis. In my mind this is an under appreciated car. Unless you really have a need for a convertible, the 450SLC is a great choice and a real bargain. Located in Marietta, GA, click here to see the Craigslist listing for this car. Do u know whether or not the rear window in the 74 450 SLC is interchangeable with a 78 or 79 450 SLC?